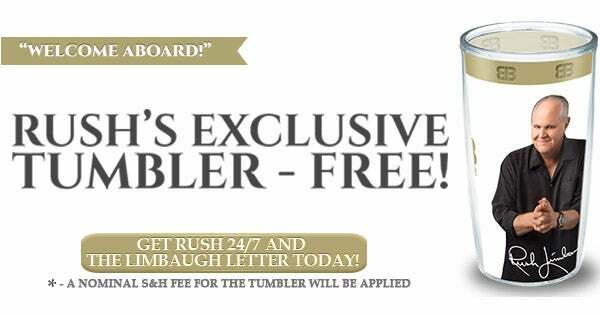 RUSH: By the way, we have a brand-new ornament for sale. We’ve never gone to this degree of detail, and, you know, I’m gonna say quality. We’ve really upgraded the quality of our annual EIB Christmas ornament this year. I’ll have more information for you as the program unfolds, but you can see it at the EIB Store at RushLimbaugh.com. Normally what we do is give an ornament away to new subscribers to the website and the newsletter during the Christmas season. We’re doing it a different way this year. We’re continuing the premium, the prize, if you will, given to new subscribers, which is this. Show them on the side camera here, Brian. It is a new Tervis tumbler and that is what everybody gets with a new subscription. Of course, a picture of me, some pithy things I have said, P-I-T-H-Y. I’m not mispronouncing anything there, pithy things. And the ornament is now an item that is for sale at the EIB Store. They’re hand forged, they are handmade by an American company in Pennsylvania, and they’re just gorgeous. It’s not a multicolored ornament. It’s not like that. 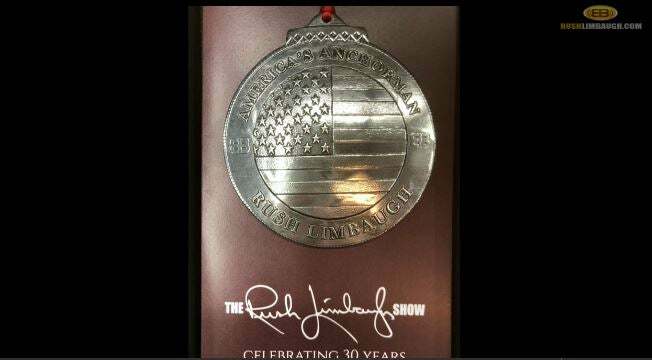 This will look different than any other ornament you have on the tree, but until I get time to go into detail about it you can see it at RushLimbaugh.com at the EIB Store.